UVO Skin Enhancing Multivitamin Drink Mix is relatively different than any multivitamin drink mix I have ever used. Not only does it restore beauty, promote anti-aging, and drinking it supports skin health. It is a vegan, gluten free, non-gmo drink mix without preservatives and no artificial flavors. A dietary supplement to the max that you just mix with water and drink. There you go. You are ready for the day. The purpose of UVO is to help skin look better and to help it look better from the inside out. UVO comes in a powdered form that you drink with water once a day. It contains many vitamins and minerals that are good for the skin. Especially things like Vitamin A, C, D, E, Biotin, Folate, Zinc, Selenium, Copper, and the UVO Proprietary Blend. The blend is what helps the skin look better. Biotin also helps the skin look better too. And it helps the hair and nails grow faster. The proprietary blend will definitely help the skin look better as these are all nutrients that the skin uses in skincare (but in a smaller molecular form) to help anti-aging. contains polypodium leucotomos extract, Milk thistle seed extract , ginkgo biloba leaf extract, alpha lipoic acid, citrus bioflavinoid complex, grape seed extract Coenzyme Q10, Eigallocatechin gallate (EGCG) marigold extract, lycopene, Resveratrol, Zeaxanthin and Billberry Fruit 4:1 extract. Drink 1 packet with 8 oz of water daily. You should see a difference in about 3-4 weeks. Here is a before photo and an after photo. The before photo was taken 30 days prior to me taking the UVO Skin Enhancing Multivitamin. Not only was I taking this during this time but I was also using Retin A and brightening masks, serums on my skin. My skin looks much better now than it did before. You can immediately tell that my skin is less broken out, it is brighter and more even toned. And has less hyperpigmentation than it did before. I did nothing to this photograph except change the name. My skin looks a bit more pink but I think that is the lighting. I'd say after a month's use this drink worked as well as a serum or cream. If not better. I was also using brightening products at the time too but there is no way they did this much work on their own. 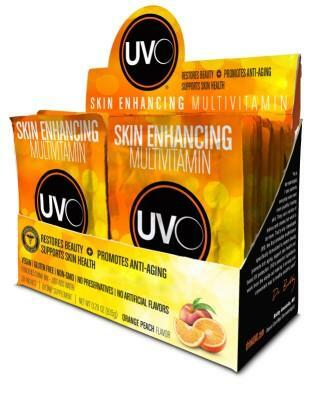 UVO Skin Enhancing Multivitamin Drink retails for $49.95 for a month's supply. It can be purchased online at www.drinkuvo.com. Like UVO on Facebook: https://www.facebook.com/drinkUVO; Follow UVO on Twitter: @DrinkUVO; Follow UVO on Pinterest: https://www.pinterest.com/drinkuvo/; Follow UVO on Instagram: https://www.instagram.com/drinkuvo/ and Subscribe to UVO on YouTube: https://www.youtube.com/channel/UCJApDs2r6ACf4lHcCNG8fuA.